For a being to purify, illuminate, or perfect another doesn’t merely mean receiving the holy and transcendent fire, whose origin is in the One, but to also share it with those who rise to participate those beings. Each triad has one of these functions, the highest perfects, the mean illuminates, and the lowest purifies. Raise souls upwards towards participating Nous (The divine mind/Celestial Demiurge) in union with the divine (henosis). To incline souls towards the generative or physical cosmos. Since most divinities derive from the Intelligible Realm, this hierarchy is based on their ontological activities. 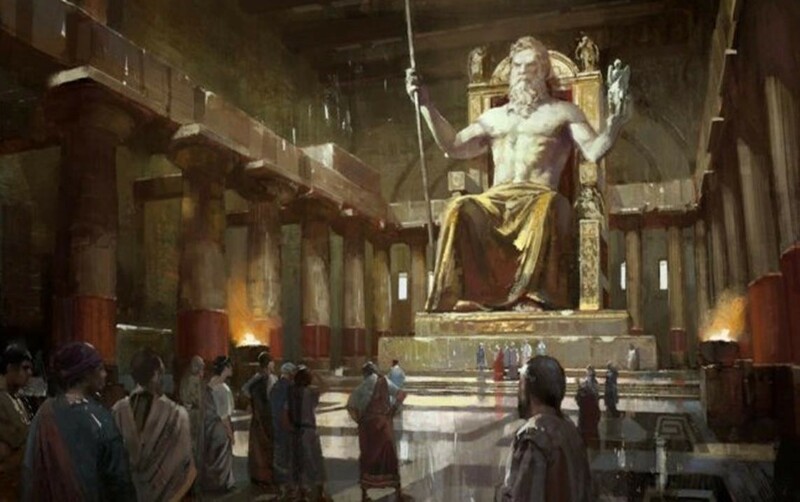 The Hypercosmic Gods are offspring of Zeus-Helios, being made up of 12 powers. Hypercosmic Gods hold the function of Perfection. The appearance of the Hypercosmic Gods is uniform, suggesting they don’t appear through the likeness of human imagination, but rather appear as themselves fully, without the overlay of symbols from their respective mythologies. Their appearance shines forth with an overwhelming essential benevolence that stems from their connection with the Good; which is in line with the idea that the Gods are completely good and incapable of evil. The uniformity of the appearance of the Hypercosmic Gods extends to their shape, size, form and general appearance, in that they are entirely perfect and unchanging, which reflects the high level of reality these Gods represent, and as such their divine appearance reflects the very nature of tranquility and order. The order they represent presents itself as an “ineffable symmetry” (Iamblichus De Mysteriis, II.3, 89), partaking in Beauty itself, and as such their divine manifestations are unimaginably beautiful, causing sensations of joy in the Theurgic Sage who bares witness to these divine powers. A distinct quality of the Hypercosmic Gods is their fire and pure light. This fire is inseparable from its source, and is indescribable due to its purity. Partaking of the intelligible fire of the Intelligible Realm, their godly flame fills the cosmos during divine manifestations. Their light is ineffable; a light that is beyond all light, whether that be natural or supernatural. This brilliance extends to their manifesting images, which are brilliant and based only in themselves. Such as in the myth of Semele’s exposure to the unconstrained Zeus, their divine brilliance is unendurable to a mortal bounded to corporeality; physical eyes cannot bare witness to it, nor can lungs as they would be asphyxiated. The Hypercosmic Gods’ activities occur instantly; their actions inseparable from their originating thought, being completed as they simultaneously arise. Being instantaneous in nature, their divine activities are also motionless. When present before us, their divine power is absolutely perfecting, not simply raising our souls towards divination and henosis, but causing us to attain those states. Their benevolent powers bring about health, virtue, and purity in the body, soul, and mind; raising every quality towards the Good from which it originates, purifying and illuminating us until our souls shine with their own purity. Finally, they free us from the influence of the Generative Cosmos, allowing us to become Purified Souls. The self-granted visions of the Gods are seen “more clearly than the truth itself,” (Iamblichus De Mysteriis, II.4, 93) and are filled with a divine light that distincts them from all else. Their presence is so great that it’s enough to even outshine the entirety of the heavens and make the earth itself tremble at their approach. Such visions show the Hypercosmic Gods surrounded by Encosmic Gods, Archangels, and Angels. These holy epiphanies fill our souls with truth and power, aligning even our earthly activities with their own and granting us success in our endeavors and the blessing of Providence for all of the days in our lives. The Hyper-Encosmic Gods, also called the Liberated Gods, are the mean between the Hypercosmic and Encosmic Gods, existing between the Encosmic and Hypercosmic Gods, acting as a median and bridging the two realms together. Their function is illumination. Although the Hypercosmic Gods are ultimately responsible for the liberation of souls, the unliberated soul cannot connect to their transcendent nature; and thus we begin to explore why the Hyper-Encosmic Gods are also referred to as the Liberated Gods. The Hyper-Encosmic Gods are the lowest of the Hypercosmic Gods and the highest of the Encosmic Gods; their lives being double, being partially transcendent while somehow partially immanent. They are a mean to the Hypercosmic Gods, and if these Hyper-Encosmic, or “Liberated” Gods aren’t both in our Encosmic cosmos as well as above it, then there wouldn’t be a way to lead souls to the Hypercosmic Gods. Unfortunately, no text of Iamblichus survives which precisely identifies the Hyper-Encosmic Gods. The Celestial Demiurge divides the 12 powers of the Hypercosmic Realm through the power of the zodiac to produce 36 Encosmic Gods, also called the Celestial Gods, Celestial Archons, Visible Gods, and kosmokratores. They have a function of Purification in the cosmos. Engaged in time, their ruling archonic activities are powerful and astonishing to bear witness to. The Encosmic Gods have sovereignity over the ordering of the cosmos and can bless the theurgist with arcane wisdom of cosmic cycles. That authority is reflected in their appearances. Their manifestations are accompanied by benevolence of a cosmic and celestial nature, filtering down to the material life as they may. Their appearance is truly striking and furthermore, much like the appearances of Hypercosmic Gods, their appearances are also stable and unchanging, despite of where they manifest. The presence of these Gods brings about an enduring steadfastness in those who bear witness to them and the space around them. As a ruling class of entities, their beauty is self-derived and independent from matter, unlike the Sub-Lunar Gods. Their fire is relatively pure and transparent, being free of material accretions. Being active in the Realm of Generation, without descending into it, the appearance of the Encosmic Gods isn’t harmful; though they may be surrounded by powerful phantasms that could afflict the soul. When appearing in a theurgic vision, the Encosmic Gods manifest clearly and with an air of undeniable authority. Unlike Hypercosmic Gods, these deities aren’t accompanied by lesser beings, but rather gather around them the ordering of the cosmos. The contemplation of such beings brings about the movement of the soul into line with cosmic order. The 36 Encosmic powers are further divided into 72 Sub-Lunar Gods below them. The Sub-Lunar Gods, literally “Gods below the moon,” also known as the Hylic Gods, Material Archons, and simply “Archons,” rule over the material cosmos below the realm of the moon, which is the last of the heavens. Unlike the Encosmic Gods, the Sub-Lunar Gods are surrounded by matter. As they are the highest part of the Sub-Lunar Realm, their function is Perfecting. In general, these leader Gods are marked by a boastfulness in power and deed. Their appearance is marked by a benevolence of a material nature, bringing forth with them the best aspects of material life while also attracting to themselves the chaos of the material world, leaving souls in their presence freer from a turbulent life. Their appearance is striking, similar to the Cosmic Gods ranked above them; however, they bring with them the chaos of the material world. The presence of a Sub-Lunar God is thus something that is overall unstable, changing in shape and size, and having a variety of different forms because of their proximity to matter. They are beautiful, but their beauty is artificial— omitting a sense of grandness that isn’t reflective of their material functions. Unlike the Cosmic Gods above them, the fire of the material Sub-Lunar Gods is mixed with the elements, dim and divided. Like the Encosmic Gods, the appearance of a Sub-Lunar God isn’t harmful to one, though they may also be surrounded by powerful phantasms which may afflict the soul (which immediately brings to mind Dionysos’ entourage of Satyrs, Pans, and Bacchanals). In a theurgic vision the Sub-Lunar Gods manifest dimly, surrounded by the accumulation of matter, but with an air of certain authority. Like the Encosmic Gods, the Sub-Lunar Gods aren’t accompanied by lesser beings, but rather gather around themselves material elements and their proper ordering. The contemplation of such beings brings about the movement of the soul into line with the order of the material portion of the cosmos. The first of the Greater Kinds subordinate to the Gods are the Archangels; who are at the top of the median triad, holding the function of Perfection. Archangels assume the duties of a Personal Daimon once the soul the Personal Daimon looks after has moved onto the worship of the Hyper-Encosmic Gods. In general, the appearance, activity, and visions of the Archangels are similar to those of the Gods, though are always less. As servants of the Hypercosmic Gods, Archangels appear much like them; though always inferior in nature, emanating a stern but gentle quality. Similarly, Archangels reflect a shape, size, etc. that is by large uniform, however, aren’t quite perfectly in their uniformity, nor do they share in the singleness of essence of the Gods. Again, tranquillity streams from the Archangelic presence, but unlike the stable tranquillity of the Hypercosmic Gods, the Archangelic tranquility is associated with the sense of motionless activity. The appearance of an Archangel is filled with beauty, though it’s always lesser than that of the Gods whom they serve above them— and likewise, their light and fire is supernaturally bright, but not a brightness beyond brightness. Furthermore, their fire is seen encompassing and surrounding them, and their flames may sweep ahead or behind as they manifest. As secondary beings, the archangelic radiance, as is the radiance, or lack thereof, of all the other Greater Kinds, seems rooted in something else, such as the brilliance of their God. Their holy fire and light is not quite as unbearable as that of the Gods above them, though they are still undoubtedly powerful and unendurable to humans. Like the Hypercosmic Gods, the activities in which the Archangels are engaged are completed in the same instant they are conceived; however, their movement is now associated with those accomplishments. Though their function is anagogic, it doesn’t achieve the complete perfection of the soul. Though benevolent, and bringing about health, virtue, and purity, the powers of the Archangels are such that these do not come about perfectly nor completely. The visions brought about by Archangels are perfect and true, setting parts of the world in harmonious motion as a light goes forth announcing their presence. Like the Gods, Archangels appear surrounded by lesser divinities, consisting of Angels who orbit around the same originating divinity. The epiphanies granted by Archangels fill our souls with truth, but only the portion of truths to which the Archangel concern with, and not the whole of the truth that the Gods encompass. Each Archangel presents its truth and power to us appropriate to the soul which receives it, and not wholly and completely, thus granting us a portion of Providence while we are still subordinate to Fate. As the second member of the median triad of Gods & Greater Kinds, Angels hold the function of illumination. Because motion is their primary feature, angelic actions aren’t accomplished instantaneously. Holding the function of illumination, Angels help loosen the sway of the realm of generation through gnosis; though they don’t free us from it. However, that illuminating power makes the above visible to the below, and with that brings in the soul the courage to fully imitate the divine through theurgy, and in doing so participate in the divine will of the Gods and Celestial Demiurge. Just as those ranking above them, angelic benevolence brings about benefits to body, soul, and intellect; however their lesser power only allows for benefits particular to their individual essences, and in manifestation, those blessings aren’t nearly as great as the illumination embracing them. Just as Archangels are lesser in appearance, power, and activity to their Gods, Angels are more inferior than Archangels. Angels have a similar solemn and gentle presence as Archangels, though are less stern and milder. The appearance of an Angel brings with it a sense of order and serenity, but one that’s marked by movement as opposed to the perfect tranquility of the Hypercosmic Gods. Though they have bright & angelic beauty that they receive from above, it is only partial to that of Archangels. The dimmed radiance of Angels means their presence is able to be endured by us, which allows the theurgist to engage with them in ways that aren’t possible with the suffocating presence of the divinities in the ranks above them. Angelic fire is described as divided in nature, sometimes appearing with it, occasionally prior it, and sometimes following it, except when the Angel appears in their utmost perfect forms. Overall, Angels have a simple appearance, modeled after the God they orbit. They’re lesser to the Gods and Archangels in every way, though their size, shape and so forth remain stagnant and unchanging. When appearing in a theurgic vision, Angels are slightly less than perfect, though their form is clearly visible, as their light is not as blinding as that of an Archangel. The presence of an Angel isn’t accompanied by lesser beings, but rather, their presence reveals those activities that are proper to them. The magnitude of epiphanies received by us when we invoke the presence of an Angel is reduced than that of an Archangel, bringing about a “rational wisdom, truth, pure virtue, a firm knowledge” (Iamblichus De Mysteriis, II.9, 105), and an order which is proportionate to the purity of soul and power of the invoked Angel. Generally, the activities of Daimons appear faster than they really are, and their work isn’t accomplished at the moment of its conception. Their duty is to distribute the divine impulses they receive from the divine above them to the Realm of Generation below in a harmonious and ordered way. They are responsible for the binding of souls to bodies, which causes our fallen souls to associate themselves with those bodies and thus bind us further to the “chains of Fate” (Iamblichus De Mysteriis, II.6, 99). Unlike the other superior beings above them, Daimons have many varied and complex appearances, their form and size varying at different times. Whereas Archangels are stern and Angels are mild, the Daimonic countenance is fearsome; especially for the impure. I. Personal: A Personal Daimon (Oikeos Daimon) are patron divinities over our spiritual development. Though they belong to the Encosmic Gods (who are the Leader/Visible Gods), they fall in the domain of Generation and are thus under the guidance of the Sub-Lunar Demiurge. They’re designated to watch over an individual soul before it descends into matter. That particular Daimon “stands over [its soul] as the fulfiller of the various levels of life of the soul” (Iamblichus De Mysteriis, IX.6, 335) and binds the soul to its body, watching over the human for as long as they live, and likely for long as the soul is tied to generation. They oversee matter. The Personal Daimon is there to protect you, ward away danger, guide you, inspire you like a personal muse, and even help you attain good fortune. The chief of concerns of one’s Personal Daimon is to give correctives if one gets too far off track from vertical alignment with the Good. You are in danger if you are not corrected in this fashion, for you may be allowed to drift into evil. Often, it does all of this without you being aware of it. In the divine Plato’s dialogue, the Apology, Socrates states that his own Personal Daimon never instructs him what to do but merely warns him when he’s about to make a mistake. Therefore, the Personal Daimon preserves the free will of the person it oversees by allowing them to determine their aims and how to pursue them without interference, however, it will give warning when those goals aren’t spiritually healthy. Personal Daimons guide our lives until a worshiper moves onto the Median form of theurgy and engages in the worship of the Hyper-Encosmic Gods, to which Archangels replace their roles (Iamblichus De Mysteriis, IX.6, 335-7). II. Punitive: Unlike the Personal Daimon, Punitive Daimons operate in a general judgmental fashion and aren’t connected to a specific soul; their function being the judgment of impure souls. Punitive Daimons are able to advise us on the proper course of moral action, viewing all such activities from a superior position that’s outside of time, and are thus able to see the full ramifications of any and every action. They’re understood to work against unjust human endeavors while cooperating with the just. Punitive Daimons are able to harm, or even kill a human for their actions if deemed necessary. They give visions of their terrible power when manifesting. They are led by Sub-Lunar Gods. They oversee matter. III. Relational: The last kind of Daimons are called Relational Daimons (Iamblichus In Timaeus, fr. 80), also called “Elementals.” They and are Daimons without reason or intelligence as we understand, and their general role is overseeing of the functions of their particular portion of the physical world. Each of these Daimons hold a single function in the material world, having “been allotted just one power, in the apportionment of tasks which has been prescribed for each entity in each of the parts (of the universe)” (Iamblichus De Mysteriis, IV.1, 205). The Relational Daimon’s irrational nature can be commanded by humans, both theurgists, and sorcerers. This is because the human intellect, which participates Nous, behaves as an organizing force for Relational Daimons; especially when that intellect is in harmony with the ordering of the cosmos via theurgy (Iamblichus De Mysteriis, IV.1-2); but may also work when the intellect has crafted an artificial order through the use of sorcery (Iamblichus De Mysteriis, IV.205-6). Like the Punitive Daimons, they are led by Sub-Lunar Gods. However, unlike the Personal and Punitive Daimons who oversee matter, Relational Daimons are immersed in it. Due to this association, the appearance of their pneumatic vehicles brings with them an eldritch sense of disorder. The pneumatic bodies of these Daimons without reason, being surrounded by matter as they are, are said to take on a material vestment that are peeled off just as human bodies that are cast aside by the soul upon death. We can conclude that all Daimons are associated with matter in some form or another. Though frightening to witness, Daimons are nonetheless beautiful. This beauty is arranged in proportions, and unique to each Daimon as opposed to the general beauty possessed by their superiors. The brightness of a Daimon is similar to that of an angel’s, though more divided and not always of the same magnitude. Their fire casts a smoldering glow akin to ember rather than the brightness of those prior. Heroes make up the middle rank of the third triad, being beneath the Sub-Lunar Gods and holding the function of illumination. Though Heroes are not as complex as Daimons, they have a function that might seem anagogic: To encourage humans to thrive towards a virtuous life, which is the first step towards a theurgic life. However, while Heroes are concerned with virtue, they lead souls in generation, through those virtues, towards a concern for the well-being of the material world (Iamblichus De Mysteriis, II.5, 95). Heroes are a lot less frightening than Daimons appearance-wise, and like Daimons, they may appear differently at different times, and in a variety of sizes. Their appearances are characterized by movement and the urging on towards great deeds. The appearance of Heroes is always beautiful to witness, though are not as beautiful as those who rank above them. Where Daimonic beauty is reflective of the ordering of the cosmos, Heroic beauty is courageous. The activities of Heroes are the arranging of souls in an orderly manner due to their essential nature as vital beings (Iamblichus De Mysteriis, II.2, 83), the natural leaders of human souls, and their life-giving and purifying power (Iamblichus De Mysteriis, II.2, 83). Their activities are magnificent to behold, but not as swift as a Daimon’s. While their manifestation can further bind our souls to bodies by filling us with a desire for the Realm of Generation, they bring with them the zeal for the perfection of the soul through the virtues and a desire to perform great and heroic deeds. As a result of being farther removed from primary causes, as well as working within the natural world, Heroic fire is blended with pneumatic accretions, much like the Sub-Lunar Gods. That fire is similar to that of Daimon-kind, but not as grand or powerful, and appearing unstable at times. Being dimmer in brilliance than Daimons, Heroic presences are entirely bearable, though their presence evokes a greatness, and their arrival can cause the earth to move and sounds to occur. When appearing in a theurgic vision, the images of Heroes, like those of Daimons, are often blurred by the darkness of their fire. Purified Souls (Psuchai Achrantoi) are those that have either raised themselves above generation or outright never fell into it. They hold the power of Purification, and are the last of the divine beings, beneath them only being humans and irrational animal souls. Since human beings are a combination of both a Rational soul and a Irrational Soul in a single body, Iamblichus places the rational Purified Soul under the fourth Parmenidean hypothesis, since it deals with this topic. The appearance of a Purified Soul is similar to that of a Hero; though not as awe or exhilarating. Furthermore, they’re very changeable and smaller than those of a Daimon or Hero. These souls frequently have stamped upon them the dominating appearance of the God within whose train they are embedded. Their light is visible, but intermittent and dim, and even while pure they may still have remnants of their time in generation marking them. Occupying the lowest of the divine ranks, Purified Souls tend to be unaccompanied. However, the purest of these souls will manifest in a formless manner cognate with the Whole Soul. The activities of Purified Souls are primarily katagogic in nature; however, the purest of these souls may have an anagogic effect, bringing human souls still bounded to the material an awareness of the spiritual world above them. When Purified Souls manifest in a theurgic vision, they bring with them goods that can make human life more bearable in relation to the God they’re connected to. Pure Souls are particularly likened to bees by Porphyry, who writes that “All souls, however, proceeding into generation, are not simply called bees, but those who live justly, and who, having performed such things as are acceptable to the Gods, will return whence they came. For this insect loves to return to the place whence it came, and is eminently just and sober” (Porphyry, On the Cave of the Nymphs, 18).